Extendable dressing aid with shoe horn makes getting dressed easier from head to toe. Shoe horn on one end helps guide your heel into shoes, boots and slippers, saving you from bending and reaching. Opposite end features dressing hooks that help you pull on socks, shoes, pants and tops without straining. 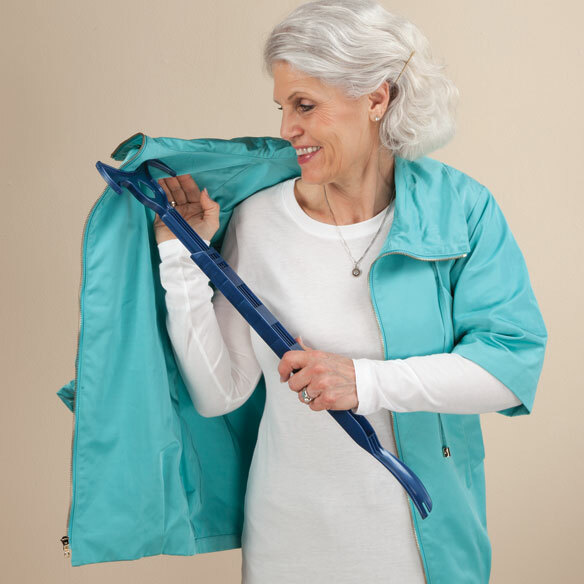 Handle extends 23”–31”L for easy use while sitting or standing. 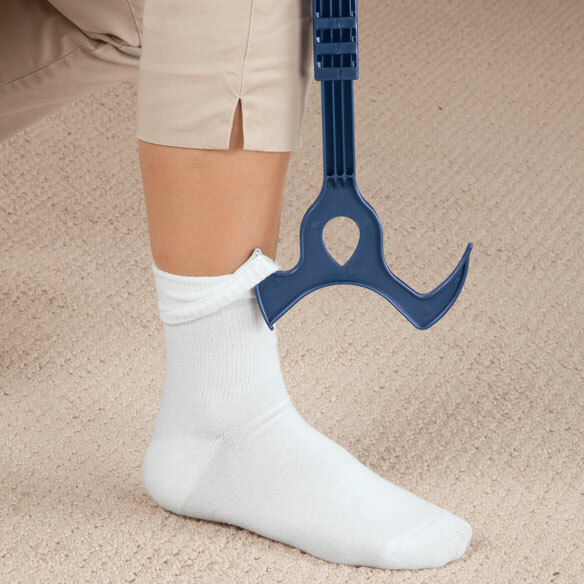 Easy-to-use sock assist tool makes dressing easier. Versatile design is ideal for all types of clothing. Perfect for anyone with limited mobility. 6”W handle; shoe horn is 1 1/2”W. The adjustable button not strong enough to hold 2 parts tougher. Had to put some duct tape on the arm of the thing to keep it from coming apart. Not sure why two hooks necessary. Hard to get into pants opening with the opposing hooks. A bit bulky to handle while trying to get pants up. Need help dressing because of shoulder problems. Can't lift left arm so dressing is difficult. Limited range of motion issues. I sometimes have a hard time finding my sleeve when dressing. I hope this will be a great help. I am often alone when prepairi g to leave tbe house, I am hopeful that this item will make dressing when alone an easing task. A friend of mine just recently had back surgery, and this tool will help her immensely. Thank you for making it available at an affordable price. I'd like to try a device that might help me get a coat on easier. 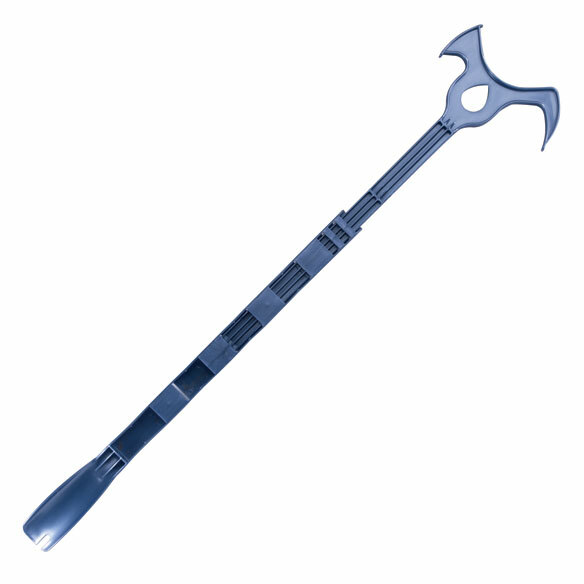 I have one but it isn't extendable. Handyist gaget ever for dressing. do to shoulder surgery to both shoulders unable to put coat on. I have trouble getting dressed in the morning. I am hoping this will be a perfect solution. My shoulders don't work good so I thought this will help get different clothings on. Being a senior citizen I need these Aids in my Life Thank you. does a use pamphlet or book come with the dressing aid? BEST ANSWER: Thank you for your question. No, instructions are not included. We hope this information will be of help to you.